We all know as Jews we are not allowed to get tattoos. What I always find interesting is when more secular Jews get tattoos they often get tattoos that have a Jewish theme. 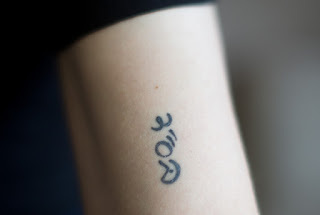 I have seen Hebrew names as tattoos as well as phrases from prayer like L'olam Vaed- forever and ever. It always makes me laugh. Not only do they have tattoos but they make a profoundly non-Jewish ritual very Jewy. I guess that some aren't even aware that they are not supposed to get tattoos so for them they are just trying to connect it to their Jewish selves. It still makes me chuckle. Happy Lag B'Omer and happy spring. It was such a beautiful day today. I love this weather. Its in the mid 60's before it gets really hot outside. Wishing everyone a good shabbos with a pre shabbos video. I came across this video a few days ago not realizing at first that the original air date was April 23, 1967. I don't think that its coincidence. Forty five years later this routine is still fresh. Joan Rivers always makes me laugh. Some weekends I am really over scheduled. I am so tired that I need another weekend to recuperate. Other weekends I have more free time. It seems however whenever I say that I am just relaxing instead of with solid plans I feel that I am being judged. Why haven't I something special to do every moment of the weekend? I feel like I have to lie instead of admit that I may have slept in on a Sunday morning instead of having made plans for the ENTIRE day. On one level, I do like to have some plan for the weekend so I do things that I cannot do when I am at work. The thing is that I have such a full schedule during the work week that I like to be less regimented on the weekend. These days we are living in times where its a badge of honor to subsist on little sleep and run around like a maniac without a moment's pause. Its good to be busy, but its also okay to turn off the auto pilot and admit to smelling the roses. There are often a variety of characters at the shabbos table when one is invited for a shabbos meal. I always make an effort to be cordial to everyone . This week was no different. Today I wore a silver pendant with a white shirt . When I got home I saw that the silver pendant had really needed to be polished before wearing and that the silver stained my white shirt . Chances are at some point during my shabbos lunch meal , my pendant moved and the stain under the pendant was visible. I was glad that I had not been aware of this at the meal because I would have been really embarrassed. Short of putting on my coat there would not have been anything I could have done about it . The first thing I thought about after noticing the stain was whether or not I had acted rude, impolite or condescending toward anyone. If I had then I would have been really embarrassed.. The only thing more embarrassing than having a stain on your shirt is being a arrogant and having a stain on your shirt. Fortunately all I had was a stain on my shirt. Lately those flakes have been plaguing my scalp. Not musical scales, but scales of dandruff bad enough to be deemed psoriasis. Psoriasis stinks. It itches and looks unsightly. Another reason not to wear Brooklyn black. The only way that I have found to diminish the flakes and scales is through topical medication. Its a crazy process of hair washing and creams. I am usually a low-maintenance person so I find this process unpleasant. The only good part is that psoriasis is exacerbated by stress, so when I have an outbreak it forces me to look inward and figure out what is upsetting me enough to hold my scalp accountable. Its a signal to slow down and take care of myself. To attempt to get enough sleep. Psoriasis is a warning sign that demands to be heeded, but in a way its not so bad to be forced to slow down and smell the roses. I am sending my deepest sympathy to the city of Boston and specifically to those who experienced the tragedy first hand. I always have admired those who have the strength to participate in such a famous marathon. It is so sad that someone or some group decided to ruin the joy and accomplishments of those who participated in the marathon today. I grieve for Boston. I grieve for the marathon. I grieve for those who were injured or who lost their lives. I grieve for the United States . Most of all I grieve for our world. I think that we all need a new thing to be machmir about. I know that the mitzvah that is in vogue to be machmir about is tznius, but I really think that this is being done to death and we are really need of a new thing to focus on. When rabbis started ranting about the evils of the internet suddenly no one focused on whether or not anyone was watching tv or not. Well, we need something to distract us from the tznius insanity and that would be a new mitzvah . I would like to introduce a new mitzvah for people to focus on. I think that it would be appropriate in light of the many ponzi schemes that have been committed by Jewish people of every religious stripe as of late to focus on being honest in business. I know that this is a hard one , but it is an important one in need of preserving. I am really surprised with all the finger pointing about tznius being the root of all evil that nothing is being said about Jews preserving fair business practices. Well, I am not a rabbi. I am far from being one, but I would like to put a seed of thought into the Jewish world. A lot of our brethren are suffering because many of us are not acting fairly in business and this has got to stop. It is the biggest chilul Hashem to see frum Jews in prison for not acting fairly in business. There are families who are suffering because their loved ones were convicted of being unfair in business and creating ponzi schemes. Wake up and smell the coffee folks! Tznius is an important mitzvah, but it is not the only mitzvah in the Torah and its not the only important one. The Last Night Of Ballyhoo is a charming play about southern Jews vs the New York Jew. Concisely, every year in the south there would be a Jewish dance . One of the attendees was a New York Jew. In the south the Jews were much more assimilated than the New York Jew. The play is set in 1939 Atlanta. I thought about this play recently because I am from the midwest and I have lived in New York for a long time. It is still true that New York Jews are different than Jews elsewhere in the United States. It is a long time since 1939 , but I think that a lot is the same. Many New York Jews are more assimilated than they were in 1939 but there is still a large contingency of New York Jews who consider themselves cultural Jews. They may not be too ritually observant but they still have a big Jewish identity. A lot of people who are secular Jews have told me that they feel like an outsider when they are not living in the New York area because there are much smaller Jewish communities and the secular or less ritually observant Jews have less of a cultural Jewish identity than they do. There most certainly is Jewish life outside of the New York area, but it is a lot different because the communities are smaller. You have to seek out Judaism more rather than just being a part of it when you are in New York. In New York many gentiles know more about Judaism than some reform and conservative Jews elsewhere. There is one thing that Jews outside of New York know better though.They know anti-semitism is still alive and they act accordingly. In New York you know its here, but there are so many Jewish people here you don't think about it. When you don't live in New York you live in a smaller community you are a vital part of the community and people know you by your first name because there aren't so many in the community. In New York you barely know the people who live across the street from you. One of my favorite things that nosy concerned friends like to ask is whether there is someone from my past that I would like to re-date. Usually if it didn't work then there was a good reason. Sometimes those who I would still be interested in have married. Unless the issue that breaks you up has been resolved or eliminated there isn't any reason to revisit the past. That said, I don't listen to my own advice and have re-dated and have been re-disappointed . I suppose sometimes re-dating works for some, but for me it has not. I do not recall being at any pre- 911 holocaust memorial ceremony that actually read an extended list of names of people who perished. I remember seeing lists of people who were murdered and hearing individual accounts , but never a whole reading of names of those who were lost. Maybe it was done before but I never noticed. I have noticed that at the JCC in Manhattan they will be reading names of those who were murdered during the shoah. I think that this is meaningful. I find it meaningful to hear the reading of the names of those who died during 9/11 at the 9/11 memorial every year. I admit that I don't usually listen to all of the names being read, but I guess that this is the point. So many were lost that its difficult to listen to all of the names being read . During a holocaust memorial there are even more names to be read. And those are just the names we are aware of . This video really captures the essence of the exhibit. The photos are so artistic and have a lot of heart..
Roman Vishniac Rediscovered | International Center of Photography In honor of Yom Hashoah I went to see this exhibit. For all those who may not know, Roman Vishniac took photos of the shtetl Jews right before world war two. Until I saw this exhibition I did not realize that Roman Vishniac was Jewish . This of course explains why his photos are so charming. They were taken by someone who loved his people. The photos capture the facial expressions of these people. The photos of children are wonderful. Some of the people in the photos have been identified. Some survived the war, others did not. David Eckstein was one of the chasidic heder boys who did survive the war. There is an excerpt from his shoah foundation video playing at the exhibit. 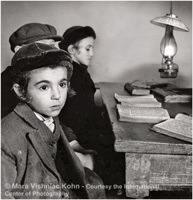 Vishniac arrived in the United States in the early 1940's. He then displayed his photos as a plea to help save the Jews of Europe. Displayed in the exhibit is his letter to FDR asking him to help the Jews who were trapped in Europe. I have seen some of the books with Vishniac's photos, but to see his photos exhibited in a museum is dazzling and it honors those who were so brutally murdered. It gives a faces to the 6 million. It makes us remember that they were vibrant people. There is 17 minute video that shows shtetl Jews basket weaving and farming .It brings them to life. It is surreal . If you live in the New York area try to see this exhibit before it closes on May 5. You won't regret it. I am always wary of becoming Facebook friends too quickly with someone I am dating. I know that this sounds strange because this is someone who has my phone number and knows where I live yet I am slow to friend them on Facebook. If it doesn't work out then what? When is it proper to defriend them on Facebook? Usually I am fortunate and they defriend me . I say that this is fortunate because the same guys who defriend me on Facebook would have been gravely offended had I defreinded them first. Then there are the exes who never defriend me on Facebook. I usually limit their access to my profile, status updates, etc, but still I would prefer to defriend them . But I don't . Its easier not to. These are the thoughts that make me nostalgic about the days before Facebook. Being single doesn't necessarily mean being alone. One can be very alone with the wrong person. One can fill one's life with people so much so that one can forget one is single. When I was in my twenties I was alone as I was single . Now I am single but I don't feel as alone as I used to. The difference is that though I am single I have cultivated friends who care about me and I care about them. True friends . Friends do not substitute for a spouse, but they are important. They are important to have even once one is married. Being single has forced me to work on myself in a way that I may not have had to had I married when I was younger. I am not saying that I would not have preferred to get married when I was younger it is just that I recognize that being single has afforded me personal growth time that I appreciate. Time is time no matter what one's marital status is. It is important to make it meaningful. Or at least try to. At the risk of sounding extremely depressed I present this post. A childhood friend's father passed away this week. It turns out that his yartzeit will be the day before my dad's. He was the same age my dad was when he died. Though a funeral may be held during a chag , shiva is observed after the holiday. This is something many people do not know. This is something that I know and will always remember, because my dad passed away during pesach three years ago. Its kind of like having extra shiva because though its not officially shiva, one is already in mourning.